I'm just a healthy & adventurous kind of guy who believes that we have a much greater say in our health & wellbeing than society has led us to believe. I for one want to live with vitality to a very old age and believe everyone has the capacity to do this provided we make the right choices. I'm just a healthy & adventurous kind of guy who believes that we have a much greater say in our health & wellbeing than society has led us to believe. I for one want to live with vitality to a very old age and believe everyone has the capacity to do this provided we make the right choices. I've enjoyed juicing fruits & vegetables for many years and know how good this is from the way it makes you feel. Last year I launched Green House Juicery and now am very proud to be suppling a super-healthy cold-pressed range of juices to people across Melbourne. I've never actually been all that adventurous with food. I believe that food is primarily to fuel the body and it can be a slippery slope (for your health) if you constantly look to food for entertainment. The more you eat fresh produce, the more you crave fresh produce and the thought of overly rich or sweet or heavily cooked foods becomes less appealing. I hope through Green House Juicery I can get people to experience this firsthand and find a different kind of enjoyment from food, one that promotes health, vitality & longevity. Despite recent entrepreneurial pursuits, I'm very much a kid at heart. My ideal day would start with a big fresh green juice (of course) followed by getting outside to enjoy a day full of activities in the warm sunshine. Perhaps start with an early morning surf and as soon as the wind picks up I'll go paragliding. Then when the wind really kicks in in the late afternoon, out comes the kitesurfing gear. Fresh fish and salad for dinner in a nice restaurant overlooking the water and sunset. My first attempt at cooking Bolognese sauce: I put all the vegetables, jar of sauce and mince meat all in the pan at the same time to cook. Little did I know that the meat needed to be browned first and the result was totally uneatable. I learnt that I'm best dealing in fresh food just the way nature intended! As a youngster I was horrified when a beating heart was ripped out of someones chest in the move Raiders of the Lost Ark. Not too scary by todays standards but it put me off all scary moves ever since. My dad instilled in me that the quality of a thing, anything, is of upmost importance. True quality seems to be getting rarer these days as we move towards a throw-away society. I am more content with one thing of quality than having 10 average things. 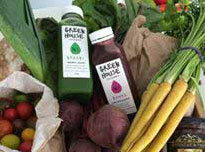 I always aim to create quality in whatever I do and Green House Juicery is no exception. Each one of my handcrafted juices is made from the best quality fresh local produce and is totally different to anything you'll find on a supermarket shelf. I'm not all that old but I like the old classics. Speaking on quality, it seems even music these days isn't made to last! Get me on a dark desert hwy with the cool wind in my hair or on a stairway to heaven and I'll be happy! I love the atmosphere most about EPM. The shade of the gums and the country setting, together with a whole bunch of small businesses and their quality offerings, makes for a really nice day out for visitors and stall-holders alike. Thanks so much Mark for the amazing insight into your wonderful business! To be in the running for the fabulous GHJ giveaway currently available please pop on over the the EPM's facebook or instagram pages to enter!